Republican lawmakers said hearings on Sylvia Mathews Burwells nomination provide a fresh opening to raise questions about PPACA. (Bloomberg) — Republican lawmakers said hearings on Sylvia Mathews Burwell’s nomination as U.S. Health and Human Services secretary provide a fresh opening to raise questions about President Barack Obama’s health care law. Obama’s choice of Burwell, the director of the Office of Management and Budget, to succeed Kathleen Sebelius will “elevate some of the concerns” that Republicans have about the Patient Protection and Affordable Care Act (PPACA), Representative Marsha Blackburn of Tennessee said on CBS’s “Face the Nation” program. After initial stumbles, PPACA beat initial forecasts as the first open enrollment period ended on March 31. About 7.5 million people signed up for private health insurance through the Patient Protection and Affordable Care, Sebelius told a Senate hearing on April 10, hours before her resignation was announced. Sebelius said she decided to leave after feeling “optimistic” the administration would meet its enrollment goal and recover from a “terribly flawed and terribly difficult” launch of its health-care website last fall. In an interview broadcast today on NBC’s “Meet the Press” program, she said she wasn’t forced out. Republican lawmakers said they want details on how many enrollees have paid for their plans, the age composition of the enrollees and how that will influence insurers’ decisions to raise prices next year. See also: Will the change at HHS help the Democrats? Republicans have said that PPACA will be a central theme of their campaign to defend their U.S. House majority and win control of the Democratic-held Senate in the November elections. Democrats have said they’ll defend the law’s provisions, including its ban on denying coverage based on pre- existing medical conditions. One of the key issues will be whether there will be high costs for individuals to get insured and whether that will drive people away. WellPoint Inc., the biggest commercial insurer in the health law’s exchanges, said last month it may seek “double-digit plus” premium increases for 2015. Many other insurers have declined to comment on next year’s rates. Democrats will use Burwell’s confirmation hearing to “tell the real human stories” about the health-law’s benefits, Senator Sheldon Whitehouse, a Rhode Island Democrat who sits on the health committee, said on Fox. “We have got to look at the good things, and we’ve got to go out there and make it clear that it’s something good for America,” Representative Elijah Cummings, a Maryland Democrat, said on CBS. 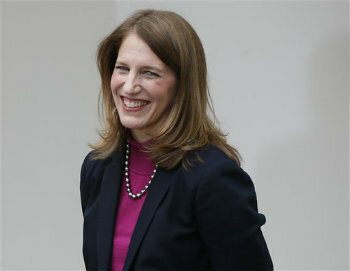 Obama announced April 10 that he would nominate Burwell to succeed Sebelius, who drew criticism after the administration’s health-care website didn’t work for about two months last fall. That period “was a pretty dismal time,” though the surge in enrollments in December was “very gratifying,” Sebelius said on NBC. Sebelius, who’s served five years as HHS secretary, said she told Obama in early March that the end of the first health- care enrollment period on March 31 would be the right time to initiate a leadership change at an agency that spent $886 billion in 2013, about one-fourth of all federal dollars. Burwell’s nomination is subject to confirmation by the Senate, where Democrats control 55 of the 100 seats. The Senate last year confirmed Burwell for the OMB post on a 96-0 vote, and Senator John McCain, an Arizona Republican, said April 10 on Twitter that Burwell was an “excellent choice” for HHS. “I hope the Senate confirms Sylvia without delay,” Obama said April 10.